Newcastle are lining up a number of players to bring in during the January transfer window and we would have hoped the players would be able to make an instant impact in case we are still in the relegation zone or close to it. So with that background, it’s a bit of a surprise that Newcastle are reported (by the Chronicle) to be interested in signing Southampton’s Gaston Ramirez in the January transfer window. 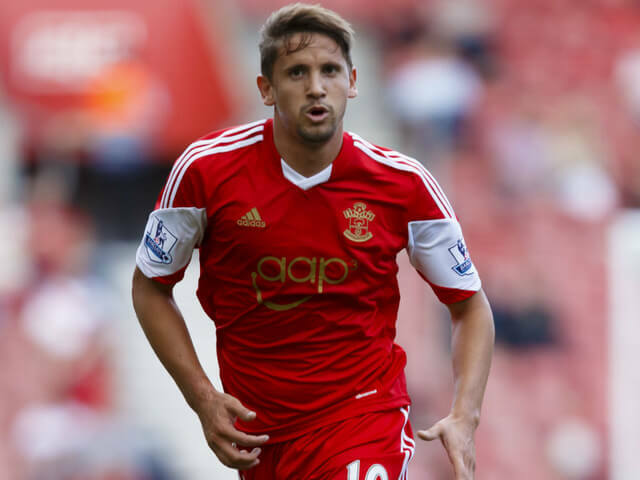 Gaston Ramirez – Newcastle interested – why? Ramirez was signed by the Saints back in the summer of 2012 from Italaian club Bologna for £12M on a four year contract and therefore his contract will come to an end next June – and Newcastle will try to get him at a cut price. But will he be good enough for Newcastle? It seems that Newcastle sometimes put how good the deal is ahead of how good the player is – and that’s not the right way to go about transfers. You tend to end up with good deals and average players that way. Gaston certainly seems a talented player and has played for Uruguay since 2010 and he currently has 34 full caps for his country. In his first two seasons at the Saints he played 48 times with 8 goals and then he was loaned out to Hull City last season where he played 22 times with one goal. Newcastle have to be very careful this January about who we bring in – and it seems we are going after players whose contracts run out next June and they could include both striker Charlie Austin of QPR and central defender Joel Matip of Schalke. If we can get those three players in then they should be decent deals but what are the chances that Ramirez can make it at Newcastle, having already failed at Southampton? Players in January should be able to make an instant impact and we have our doubts about whether the 24 year-old Uruguayan International would be able to make an impact at Newcastle. What tells people like Graham Carr and Steve McClaren that Ramirez can be a success at Newcastle when he has failed to make it at Southampton? Two of last year’s signings – Remy Cabella and Emmanuel Riviere looked like decent buys for us at the time – but they both turned out to be flops. They didn’t have any experience of English football when they came in from France – but Ramirez has – and he hasn’t been a star in England and cannot get his place at Southampton. We just don’t know why Newcastle would want to take a risk with Ramirez in January when our Premier League status could depend on bringing in the right players. One of the reasons we seem to have such a poor squad at the moment is that in the last five or six transfer windows we haven’t brought in enough good players to improve the squad. Previous Post Can Newcastle Get First League Win Against Norwich? Jonas is the exact opposite of a normal discrimination case. The law was written so people could come back to work be paid and do lighter work. I’m sure if the case has got off the ground at all he would have been told by experts if he had a case or not. No it wasn’t. It cover many aspects of discrimination. You are clearly not very “au fait” with this subject. “Jonas is complaining that he was paid and given lighter work when in fact he still wanted to play 1st team footy”. Can you please explain the origins of your above contention as to what specific complaint under the DDA Jonas is making. Or have you just made it up (again). Must have potential high resale value. But down to the total lack of knowledge and an old man (Carr) scouting for so call tactical players, forgetting pace for what ever the reason we end up with 80% of the signings being flops and the better signings go back over by being surrounded by unfit duds. The club puts resale value before strengthening a particular weak area. The whole club is flawed and destined for failure. Jib – you make yourself look a right mug by posting authoratively on all manner of subjects -some of which you clearly know nothing about – this is the danger of being totally reliant upon Google. A tip – stick to what you have knowledge of. This will reduce vastly the number of your posts. I look forward to your posts about Ladies Wrestling and Ladies Rugby. I believe he is using Spanish lawyers , the English lawyers quoted in this evening’s Ronnie Gill were a bit baffled by the whole thing so god help the Spaniards . I believe (Mr Tuff can correct me if I’m wrong ) that is British and not European legislation. The Disability Discrimination Act is very complex and covers all sorts of situations. It really isn ‘t just for folks to do lighter work whilst recuperating, it really, really, really isn’t. There’s nothing worse than a blog lawyer naive enough to think a little knowledge is not a dangerous thing. Any lawyer practising in the UK will need to be UK qualified. In hindsight, Newcastle might have benefited by offering Jonas a years extension, maybe, considering the lack of self belief in the group, but we had Cabella, who either needed to play or be sold. I wonder if the grievance is over appearance payments lost, when he was to his mind fit, but wasn’t being picked, and did play a few games for Norwich at that time, and in relation to the magic number that would have triggered a contract extension. In effect, he was fit and capable, but unfairly denied the opportunity to earn his due. I’m either an ignorant blog lawyer or the Googlemeister I wish you lot would make your minds up. Anyway in the interview Jonas gave after training today after training in Coruna he was very vague and at one stage referred to the 9 games they had to play him for his contract to automatically be extended , if that gives anyone a clue. Maybe he’s accusing the club of using his illness as an excuse to wriggle out of that clause. I hope those Spanish lawyers speak better English than you do Spanish jib otherwise he won’t gana nada ! By the way I looked it up this afternoon. He was a regular before his illness. However most fans would say last season at 31 years old and so much time off they were not surprised he wasn’t getting picked. It’s a thorny one . You never see a poor lawyer !! Jail they’ll have to appoint a Brit they ain’t allowed to practise here. Yes, from the clubs perspective was Jonas worth the extension on those terms. Taking the emotional aspect of the cancer out of the equation. But yeah, if they didn’t think he was, then they should have told him clearly, and certainly not by Pards taking him aside and suggesting he find himself a new club. They might well have done that though had the situation not become complicated by the cancer. He might just want to call them out on it as much as anything else. Any news on Charlie Austin. Jib are they ganging up on you yet again. Of course cancer is not just career threatening, its life threatening, so Newcastle really did need to conduct themselves compassionately and entirely appropriately, and it appears they perhaps didn’t. They’ve got it coming, one way or another, if that’s the case. You can’t even speak English you need to practise a bit more ! Iiiitttsss the George and Lennie shhhhooowww ! I have no problem with sale of MYM , Santon or Mehdi Abeid , they have all gone on to better things. …….and bizarrely his best mate is Newcastle CAPTAIN………so that might indicate that our skipper isn’t entirely on board, perhaps far from it………..actually, how many of them truly are? People say we need premier experience. teams won’t give up their good players, they’ll wait for Liverpool to come pay twice their value. This leaves us with the rubbish players or unmotivated fringe players from top teams. Well the problem with Obertan is his contract. We sign players, a percentage don’t deliver as hoped, and we can’t shift them. I don’t doubt the club would be happy if his contract ran out tomorrow, along\g with a few others. Hull City are flying at the moment with one of the strongest squads in the Championship. Come May , Ryan Taylor might be giving us a wave , as we pass in opposite directions. Do you think Obertan will be offered a new contract ? He is here because there is not a club in the world offering to match his wages let alone offer a fee, same with Marveaux and Goufran. Cant see there is really a case, he was kept on for the length of his contract and paid what he was owed. It would be like Raylor trying to sue. Certainly don’t agree with binning them off by phone, but to be honest i would imagine a lot of players at clubs don’t even get that. You have a contract for a specific length of time, it’s not like it’s rolling and would be expected to be automatically extended. Is there any precedent for a player suing for anything similar? I’ve seen a few players retire under similar circumstances, not sure what happens contract wise there, do they owe the club money or is it brushed under the carpet? Just to end with, Jonas should be proud of coming through cancer and still having a top level football career. Shows what a determined spirited individual he is. What’s surprised me about this Jonas matter is that it appears to have got to the stage of legal action being started. If, as one would reasonably expect, there’s been no inter-party dialogue, then somebody’s either jumped the gun or, worryingly if the Club’s dug in, that it runs the risk of further reputational damage. One would have thought that a compromise pre-proceedings agreement could have been reached between Jonas and the Club. Or could it be that Jonas’s legal advisors are looking for some prestige and a big pay-day out of it. Jib, you have no problem with those three players being sold in what sense? Would our squad be stronger if they were still here? Would have given my right knacker to see Abeid playing against city instead of Gouffy. You could imagine Jonas calling Colo into a court case to give evidence, now that would be interesting! Before anyone claims whether he’s got a case or not it would be helpful to know what exactly he’s suing them for ! Sorry went off to play footy, the club has never seriously been up for sale. The first time it was up for sale Ashley went to Dubai for a buyer…..well apparently he went to sell the club, instead he and wise were drinking and annoying the locals, they had an offer didn’t entertain the bid and came back. 2nd time round the asking price was met I know this because I knew someone who worked with Keith whatever his name is, slips my mind but he was in charge of selling the club, his past records were finding Liverpool and I believe man utd both buyers. That lad now works as legal counsel for the government of Dubai and is a toon fan. Ashley moved the goal posts and the deal died, Ashley has never wanted to sell the club and won’t sell until the punters stay away, as long as he has 50k plus attending he’ll not sell the club. The launch pad this club has given to SD is astronomical, he knew that hence why he never sold and won’t sell until driven out. When has this club ever told you truth? And you believed they were looking to sell to because that’s what they put out to the media, the Mansoor family apparently wanted to buy us ahead of citeh but I can’t confirm that, that’s what was reported, that’s what my mate says in Dubai. If he’s serious about selling there will be buyers but the bloke doesn’t need to sell as we happily fulfil he’s wishes by attending, next seasons bumper deal which is reported to be 100m per club will also keep him here!! Jib Jibberish (the blog pest and part-time multiple) – you are certainly having a bad day today – normally I only anticipate one gaffe from you but today there are many. Yes you’ve guessed -wrong again. your post is not correct. If you are a qualified solicitor in your own country (includes Spain) there is a means of practising law in the UK. The Qualified Lawyers Transfer Scheme allows you to prove your experience and take certain examinations known as QLTS. If successful you can then apply to be “admitted to the roll”. Then you need to pass a test by the Solicitors Regulation Authority. Then you can practiice law in England and Wales. Please do not venture into areas you know nowt aboot – as I previously advised you. Williamson , Marveaux , Elliot , Steven Taylor , Shane Ferguson , Kevin M’Babu . all have contracts that run out next June. It shows the difference between the club and Mike Ashley and his cronies, I refer to the footballing side of NUFC as us, the callous and ridiculous business side as them ! That’s for people who up sticks and move countries , I have one just down the road from me , it took him 5 years to get entered on the rolls. I don’t think Jonas has that long ! Anyone know of any jobs going round the town? Jib Jibberish – well I can only say he must have been thick like you and struggled with the examinations. You Pallion Plonker/ Pennywell Plebian. What a knacker – proved wrong yet again – I’m really getting annoyed at having to correct your disinformation to bloggers on here. Finish off your bottle of cheap cider and get yourself off to bed.